The council voted 6-3 to approve a regulatory framework for marijuana production facilities, which will be capped at 40 businesses. Councilmembers Zapf, Cate and Sherman were the dissenting votes. A rally was held before the meeting with advocates for these types of businesses demanding regulations that are fair, create a supply chain and serve the needs of pot users. Police Chief Shelley Zimmerman at first asked the council for a total ban on marijuana businesses. "With the legal dispensaries we have now there have been over 270 calls to service," said Chief Zimmerman at the council meeting. She has since expressed support for testing facilities within city limits. Cannabis companies depend on testing to determine how much THC is in their products. They can also test for pesticides and harmful chemicals in pot. 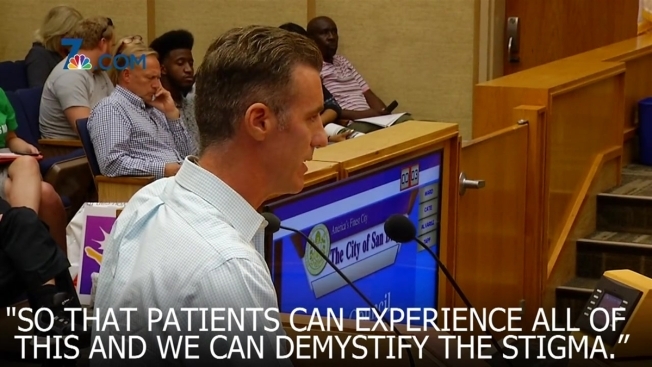 Dozens of people spoke for and against the two options that the city had to decide between. Option 1 creates a new land use with testing labs. Option 2 creates two new uses, testing labs and marijuana production facilities, which includes agricultural raising, harvesting, and processing of marijuana, wholesale distributing and storing of pot and marijuana products and producing from cannabis and cannabis products. Under the current industrial zone requirements of the city, these businesses would have to be 1,000 feet from parks, day cares, libraries, schools, and churches. Advocates for pot delivery services were also at the rally Monday asking the city council to revisit permits for these types of businesses. Right now, hundreds might have to shut their doors. "It's very important to me to provide members of the community with a safe product," said Councilmember Barbara Bry. "I look forward to broad participation from the community as we move forward in regulating this industry.